Trends Lab is a service that delivers beauty trends and audience insights to some of the world’s biggest beauty brands. My role was to help design a unique value proposition based on unmet customer needs, and find ways to streamline processes within the service offering. How do you streamline a service using design thinking? To find ways to streamline trends lab, I began research from within the service, working alongside the delivery team and observing their behaviours. This enquiry allowed me to build domain knowledge and empathy for the service operators in a relatively short amount of time. Over a period of just two weeks, the entire process was mapped into a journey map to visualise inefficiencies, pain points and core challenges. Design problems became very apparent – staying organised, collaboration and classifying trends consistently where hindering the service delivery considerably. From this understanding, we went on to prototype and test our solutions. User Interviews – I found that trends Analysts wanted to store and track trends for later use; Content Strategists wanted to pick and mix relevant trends for their creative briefs; Brand Managers wanted to know about medium-long term trends as soon as possible to build them into strategies. 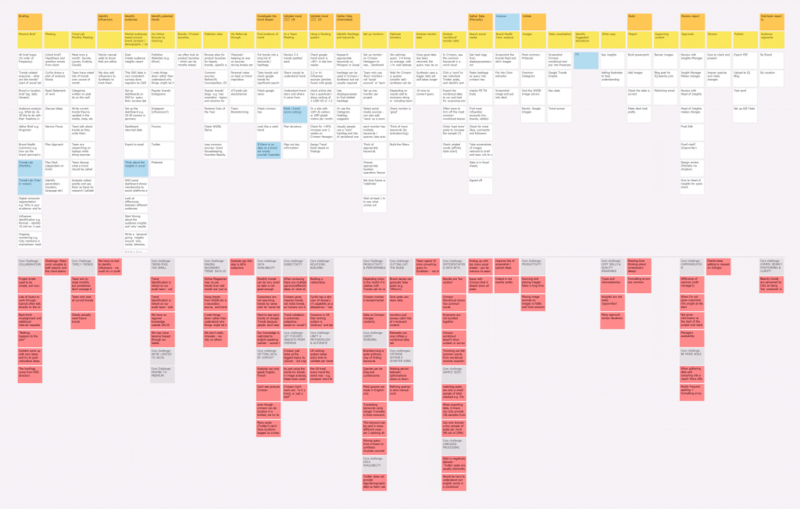 Process map – A workflow became apparent between these actors, which had never formally been articulated. Analysts needed a way to store and tracked trends, whereas strategist needed a way to discover and query trends that matched their client brief. Customer Survey – Through a customer satisfaction survey, we learnt that our customers required three core capabilities from a trends service: predictive trends, audience-specific trends, and geo-located trends. These core capabilities would become the focus of our service vision and roadmap. SWOT + Competitive analysis – Through analysis of competitors, we learnt that almost all trend vendors used a qualitative approach to trend identification which was not hugely reliable or credible. Our unique value proposition was applying an analytical approach based on quantitative data, as well as offering a solution extremely specific to our clients’ needs. After our research, we defined a product vision that would support the requirements of the service. We began a discovery phase looking at ways to unlock capabilities, as well as build the effectiveness of analysts. Co-Design workshops – I ran a co-design workshop with stakeholders and users to define a data model for trends. This helped us define ‘what makes a trend’ and a taxonomy that would flow throughout the service. For the first time, it also gave us a consistent language to talk about trends. Card sorts – Through card sort exercises, we learnt the order that users expected to enter trend data. It also helped us learn how users responded to terminology for fields and values they’d expect. We also identified several missing fields that users might need and they helpfully suggested them. Prototyping –A trends library would provide a sharepoint between actors, and maximise the repeat-value of their assets – this solution could be a low effort but high value product. A rough prototype was built to see how users responded to the concept. We wanted to learn how what information they needed and how it should be organised. The prototype (built in Excel) acted as the a focal point for asking questions during interviews – and provided just enough querying and drop-down functionality to learn what users wanted. User testing – Users were also given scenarios and tasks to complete using a paper prototypes. Using a pen as a cursor, users left evidence of their interactions – helpful for tracking correct and incorrect clicks. Moments of confusion and delight were recorded as benchmarks for future iterations. At every stage we wanted to understand the issues encountered and how they interpreted the designs. From interviews, findings were synthesised directly into user stories on a Trello board. The stories would be helpful in communicating requirements to engineers, and testing against in QA. Product requirements were gathered and validated in a couple of days. The Trends Library brought a new capability to the service, allowing trends to be recorded and tracked over time. The tool made it easier for strategists to predict the trajectory of trends and make stronger recommendations of when best to activate time, money and people against trends. Trends Library was conceptualised and built in just three agile sprints (six weeks), with a team of just three people, including myself (UX Designer, Data Scientist, Product Owner).Using a research and design style that included the users, while remaining lean kept our discovery process very efficient.